Ever wonder how does a tyre blowout look like? We have the answer here for you and after watching it, chances are you will want to swap the old tyres on your car for some new ones. 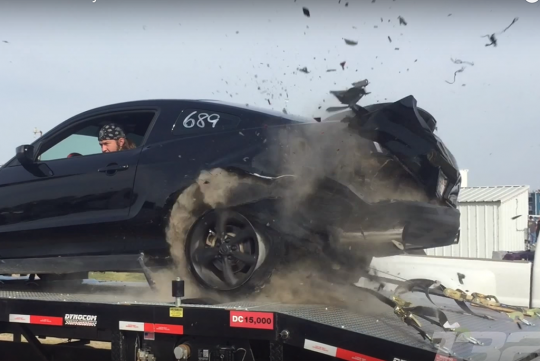 Seen here in this video is a Ford Mustang demonstrating its brute-performance capabilities on a dyno before its rear tyres gave way. When it eventually gave up at an estimated 240km/h, the force of the rubber tearing apart caused its quarter panel, suspension and rear bumper to be heavily damaged. Luckily, the people around the area were not hurt. There is no sense in doing a dyno run while running through the gears. A gear should be selected (ideally one that is closest to 1:1) and the run should be accomplished in that single gear. Higher gears are better for loading the engine, but too high a gear can lead to too much heat generation (and cooling is an issue on most dynos) - in the engine bay, that skews the results, and on the tyres on the roller dyno - well, the results are self-evident from the video. Many cars have dyno runs done in fourth gear for this reason. Also, it seems the redneck jackass was trying to do a top speed run (which would explain rowing through the gears) and not a run for power/torque, as is commonly done. This is extremely idiotic on a dyno. Theoretical top speed is easy to calculate using redline rpm, gear ratio and tire size. The dyno run can at best achieve that. But it's still meaningless because real world top speed is dependent on drag. Running a car on a level straight through the air (and averaging runs in opposite directions through a constant wind) is the only way to get a meaningful top speed. So, all in all, a waste of a nice car on an exercise in futility.